So you want your own airport. 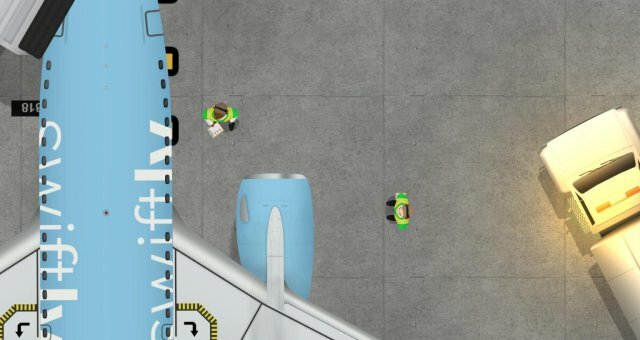 A beginner's guide to Airport CEO! Okay please be patient with me, I will be updating this with a video a little bit later that will show you everything I am talking about. First thing's first, when you first begin the game go ahead and pause it. Now that that is complete you will want to press TAB to open your opperations menu. In this menu you handle a LOT of the game. Find the STAFF section and click on Board members. You will want to open each of those positions up for applications. Once that is completed hire the board members that you think will do a good job here. The better stats the better they do at their role. Once you have all the board members go to Economy and Procurement. Start researching bag handling. Okay now that you have your board members and some research going, you will need to go to the economy tab again and go to contracts. Here you will hire your construction crew. Sometimes there's a pair of options, really just go with the cheapest available. You will want to lay down a small lay out. Remember you can always expand later, it is better to start small and expand than to overreach in these beginning phases. What I like to do is to lay down 2 medium ports right next to each other. You will want to face the airplane icon away from the direction of your building. Once those are placed down you will have a good idea of the size of terminal you will need. You can place small ports on the sides of this building. Go ahead and use Airport foundation and build a small building large enough to cover the two medium ports. Once this is down go ahead and unpause the game. Press TAB and go to opperations and bring in as many contractors as you want. In the beginning there's a ton to be built so I usually bring them all. That is though an expensive option, but at the end of the day you wont be able to make money until you are built anyway. Lay down your runway, but give a decent amount of space away from your medium ports you placed down. Now, using the taxi foundation build a taxi-way that is 5 squares thick. You will want to come off of both ends of the run way. Then you draw the taxiway down to your ports. Next you will need to place the taxi routes. Simply draw the taxi route down the middle of your 5 square thick taxi way, and connect it to both the ports and the runway. Okay now you need to divide up your terminal into secure, and non secure locations. The secure locations should be about half of your building, with all of your gates covered. You will then want to place security check points boardering the secure and non secure locations. As well as a security exit point. You will want at least 2 check in counters, as a lot of medium planes won't want to dock with your airport with out them. You will need at least 1 boarding counter per docking port. Having gate seating is a good idea as well. A few janitors, this depends on the size of your airport. You will want to also have a road leading to your building, and place bus stops and car stops along said road. At the end of this road, put a security check point. There's one specifically for transitions between normal roads and service roads. You will need this for when you buy the fuel depots and start buying new vehicles to service planes. Now it's time to schedule your flights. This is something that you will be doing a lot of. Go to your economy page, and contracts. Here you will want to find contracts that are listed as cheap, and small at first. The reason for this is that they tend to have small commercial planes for your airport. As well as some medium sized ones but they don't overwealm your systems. You will want to fill your weekly schedule with flights. I tend to refill the flight schedule every Friday in the game. Because as the flights get completed they are removed from the schedule and you will need to get more. Next thing you will want to do is set the ports to accept commercial flights. Simply click the port, and accept commercial. You will want to link the boarding desk to the port. You will need one boarding desk per port. Now, if you have small ports you want to use for commercial traffic, I suggest that you turn off the general aviation side of it. The reason is you don't want a little personal cesna blocking a potential money maker. If you want to accept general aviation later, just build specific spots for them. Unlike commercial they don't have to be attatched to a terminal. Okay now time to ramp up your services. By now you should have researched the different fuel depots, and baggage up to the baggage scan portion. I will talk about baggage in seventh phase. For now let's talk about fuel. It's a great money maker. Similar to other things in the game you will have to contract out a fuel company to buy your fuel from. Go small at first, and find the one with the best price. You will need a vehicle depot, service roads, a checkpoint, two fuel depots each with the different type of fuel. Jet fuel and prop fuel. To get the different fuel types when you are hovering over the building you can mouse over to the different icons to switch them. You will need one of each fuel depots. Now once you have those placed you will notice that your ports have roads already built on them. Connect your service road to those. Connect your service road to the main road using the check point. Go to economy, procurement and buy one of each of your fuel trucks. This should really handle the majority of your needs for a long time on a 2 small, 2 medium platform basis. Once you have contracted a fuel company and gotten your trucks you are good to go to offer additional services to your airlines. Okay not gonna lie, baggage is a lot more complicated than I anticipated. To fully understand this portion wait for the video. That being said though I will try to explain it as best I can. You will need some service trucks. These are the little trucks that carry the luggage. For the set up of 2 small, and 2 medium platforms I use 4 service trucks. You could have a couple more, it wouldn't hurt, but it does eat some additional money to do so. You will need to link your check in counters to a baggage depot. That depot should be housed in its own building near the ports. The only thing is, you need to make that building a secure zone. Failure to do so will result in your workers not actually working it. Near the baggage depot is where you will want to put the scanner. Off the side of the scanner you will see there is a red ramp. Link that ramp to a baggage destroyer. This will destroy contraband luggage such as drugs, and so forth. You will need to run a return belt to the terminal and create a room, using the area / zoning tool, for a baggage claim section. You then link all check in counters, ports, and the new baggage claim room to the baggage depot. On the depot itself, increase the number of ramp agents to 8. You will then need to hire 8 more ramp agents to service the bags. This is important because speed is the key with bags. The less delays, the more profit, the more planes you can service. For the baggage claim section simply place a large above ground belt in a circle, decorate it with some plants and boom. You will also want some seating in the area around the baggage claim. Don't bother placing seating inside the zone itself, for what ever reason they will not use it. One very, very important thing before offering bag service is to quadrouple check your belts. Make sure the arrows are all pointing in the direction you want the bags to move. This is super important. If you don't you will end up with baggage clogs, and angry airlines / customers. 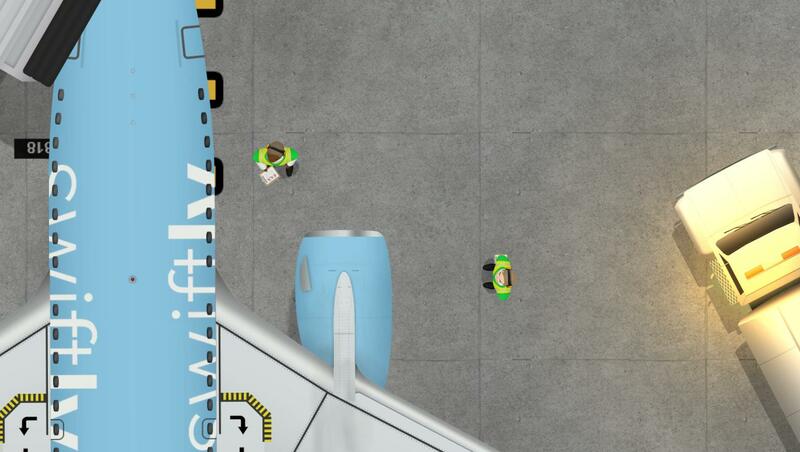 Make sure that your ramp agents are in place inside your baggage depot. You will want to bulldoze the walls of one side of the building as well. Use service roads to drive into said building, and make a U around the baggage depot with the service road, so that it is touching the item. You should leave the side with the belts alone. This will allow your service trucks to drive into the building and get / deliver the bags. Make sure the service road is able to get to the port roads, and your vehicle depot. Once all of that is complete, and you are certain that your belts are all facing the right ways, go ahead and offer bag services. If you notice a problem, discontinue offering it until you can fix it. Contractors cost hourly money to have on site. Only keep as many as you need. Dismiss them as y ou don't need them anymore. If you aren't building something for a bit to save some cash for a later project, dismiss them all. If you notice your airport is getting dirtier because of increased foot traffic you may need more janitors. Be sure to have a male and female bathroom in each section that passangers have access too. You need a staff room with couches, in order for your crew to rest. A rested crew /staff does a better job than an exhausted one. Occasionally you will have to repair your runway, and ports. Keep an eye on their damage levels, because it costs you money if your runway damages a plane.